Christian publishing and writing seems to go through phases of particular topics being popular. At the moment it appears to be issues of social justice, environmental responsibility and changing the world. It is a fantastic topic but I have noticed a lot of books coming out about it lately. Given that there is already so much being said on the topic I was a little sceptical about whether Outlive Your Life would be a worthwhile read. 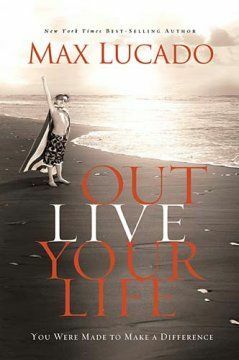 While it is not particularly groundbreaking there is a few things about Outlive Your Life that I thought made it stand out and therefore worth a look. As I have said before when reviewing Lucado’s books, he is an excellent writer with a knack for memorable phrases. This book is no exception. If you are the highlighting type you will probably find yourself highlighting a lot. More important than style, the content of the book is pretty solid. Lucado makes very clear the importance of preaching the gospel message and prayer, two things that are easy to overlook in our haste to change the world. The book also deals with the role persecution in advancing the kingdom, quite a convicting chapter. Overall I was quite impressed with the book. It would make a good introduction for someone starting to think about how their Christian faith is meant to impact the world.